2014 is a huge year for early childhood education in Australia – so now seems like a good time to ask why Australian advocacy for early learning is not working. The global profile of early childhood education has probably never been higher. Whether it’s universal access, workforce participation for women and the resultant economic benefits, or the proven link between high quality early learning and addressing structural disadvantage for children, the case to focus policy and budgets on young children is being made all over the world. Just to pick a few examples, the United Kingdom is having an active political discussion on the merits of universal childcare, which will be one of the key issues of the upcoming 2015 General Election. President Barrack Obama has also highlighted early childhood education as a priority in his second and final term of office, while former Secretary of State (and very possibly the next President of the US) Hillary Clinton is spearheading a huge advocacy push called Too Small to Fail. Canadian advocates have been running a long-term, targeted and very savvy campaign targeting local councils and the national Government – The Plan for $10/Day Child Care. Smart, focused and high-profile campaigns are being successfully run internationally. The same cannot be said for Australia. This is not to say there are not excellent advocates and advocacy organisations that are operating in Australia – there certainly are. But in terms of scale, scope and recognition to the general public? Nothing on the scale of any of the international examples. This is interesting for a number of reasons. Firstly, Australia faces many of the same political and social challenges as the countries listed above – sluggish economies, challenges to workforce participation and rising burden of cost of childcare to families. We also know from Australian data that 1 in 4 children are starting formal schooling with a developmental delay. The rising costs of ECEC, issues with availability and a new push for quality are regular items in the media. The conditions are perfect for a clear advocacy campaign to cut through. But nothing has. There is no clarion call for universal access to early childhood services – individuals are calling for it, but only as individual voices lost in a swirl of op-eds and half-baked ideas about importing nanny-servants. The Big Steps campaign has enjoyed publicity and even a significant victory – but its target is narrow (professional wages) and comes with the baggage of being a union campaign, fairly or unfairly. A new player on the block is The Parenthood, a social-media-driven network of families advocating on a number of issues. It’s too soon to effectively judge this group, but it’s important to remember that at this stage The Parenthood (despite some media attention) have not yet demonstrated they have broken through to the wider community. Their most recent campaign to quarantine preschool funding has only attracted just over 1300 signatures so far. Not insignificant, but not game-changing. 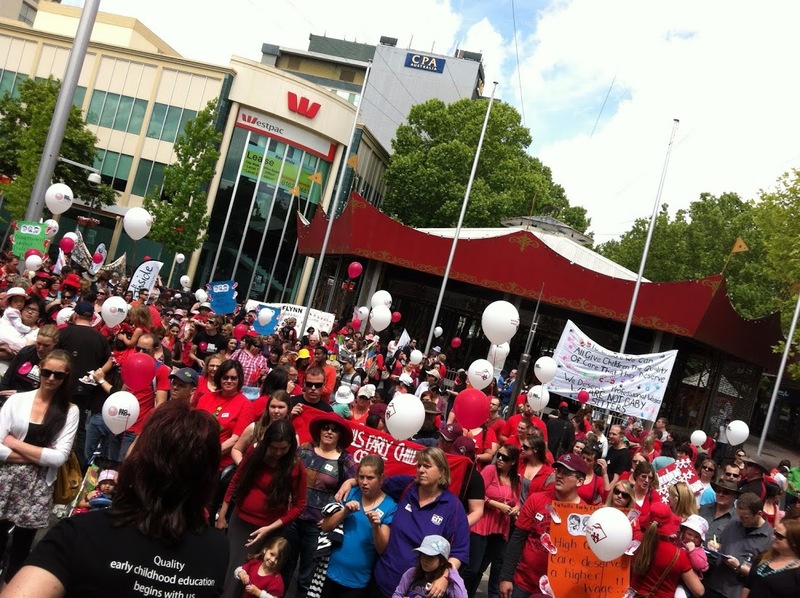 Hard as it may be to admit, the most consistently clear, targeted and successful advocacy on ECEC issues has come from Gwynn Bridge and the Australian Childcare Alliance. They are the go-to group for the media, have a close relationship with the most senior decision-maker in our sector Assistant Minister Sussan Ley, and have effectively and in all likelihood irrevocably set a significant portion of the sector against quality reforms and the raising of standards for centres. Like it or not, advocates for high-quality, accessible and child-focused ECEC need to learn from Ms. Bridge and her organisation, and they will need to do it quickly. The sector has been beset by fragmentation and a lack of collaboration. Reforms in the 1990s and early 2000s turned early learning into a market-based free-for-all. Community organisations who should be natural partners on this issue instead compete for government tenders and grants. The submissions to the Productivity Commission Inquiry into the sector revealed a frightening lack of consensus amongst early childhood organisations and stakeholders, and more broadly in the community demonstrated the lack of a single “vision” to reach for. Instead of the community having a smart, simple campaign they could latch on to, we’re stuck with whatever ridiculous thought bubble the latest Think Tank has just thrown up. The fundamental reason that we don’t have a banner to rally around is that no-one could agree what colour it would be, let alone what would be written on it. Internationally, Australia is viewed as fairly progressive – we did after all briefly elect an atheist, unmarried woman as our leader. But everything I know about Australia tells a different story – a country with a deep, long and embedded relationship with conservatism. The same country – and the same political party – that elected Julia Gillard mercilessly and callously cut her down, with more than a whiff of relaxed sighs when two successive white men in suits (and idiotic grins) took her place. The main progressive party in this country re-opened Manus Island and signed the PNG re-settlement deal. It has supported ever-encroaching freedom for intelligence agencies to collect information on us. In the last Parliament, only 48 MPs out of 150 voted for marriage equality. 26 of the “No” votes came from the ALP. To contrast, conservative governments in New Zealand and the United Kingdom have implemented laws allowing for gay marriage. The case for high-quality, accessible and affordable childcare strikes on a deeply conservative nerve as I have written before. Conservative values say the kids stay at home with Mum. Universal childcare has the potential to undermine the much-hyped about “family unit”, with Mum, Dad and the little kiddies. Despite a laid-back, “all good” image we project abroad, Australia has demonstrated time and time again that we are conservative nation that occasionally (and reluctantly) dabbles with progressive notions. Early childhood advocates will need to be strategic and persistent to defeat that. But there is a slight silver lining – when Australia does go progressive, it goes hard. Medicare is a good example. Free, universal healthcare is not going anywhere, no matter how conservative the Government of the day may be. Progressive wins, when they are completely won, are fully embedded. Universal early childhood education could be the next big win. I’ve identified the problems – now what are the solutions? Large early childhood organisations need to come together across the country for large-scale and targeted political advocacy. Getting those organisations to agree on every point will never happen – so it needs to be around something simple. For me, the focal point has to be the continuation of the NQF in its current form. Removing the points of contention and coming together around this issue is not impossible, but could have significant impact. A coalition of providers in Australia could be a powerful political force – now we just have to see if they realise it.